The Economic and Financial Crimes Commission, EFCC, Lagos Zonal office, on Thursday, May 3, 2018, arraigned the trio of Owolabi Kayode Samuel, Esther Olubukola Mate and Abimbola David-Orugun before Justice Hakeem Oshodi of the Lagos State High Court sitting in Ikeja, on a three-count charge bordering on conspiracy and stealing to the tune of N4, 576, 000.00 (Four Million, Five Hundred and Seventy-six Thousand Naira). In view of their pleas, the prosecution counsel, K.M.A. Olushesi, asked the court for a short date for the commencement of trial. However, in his response, counsel to the defendants, J.O. Odubela, SAN, informed the court that he had filed bail applications on behalf of his clients and also urged court to grant them bail on liberal terms. Justice Oshodi granted the defendants bail on self-recognizance. The defendants were also ordered to enter a financial bond of N2million each, which should be paid to the Chief Registrar of the Lagos State High Court. Also, the defendants were ordered to deposit their international passports with the court’s Registrar. The judge, however, said that the bail would be revoked, if the defendants fail to perfect the bail conditions within seven days. Meanwhile, the judge ordered the commencement of trial, after the prosecution counsel, Olushesi, confirmed the presence of his witnesses in court. Led by the prosecution counsel, the first prosecution witness, PW1, Abasiekong Udobang, Programme Manager, MTN Nigeria, told the court how the defendants misappropriated about funds meant for the treatment of people living with the Acquired Immunized Deficiency Syndrom (AIDs) and the less-privileged in the society. "MTN usually gives funds to Hope Worldwide Nigeria, since it is a non-governmental organisation, on a quarterly basis. “Those funds were usually retired to MTN Foundation as a proof that the work was done. "Every year, we usually work towards a new agenda until 2012 when we became suspicious of some of their retirements,” he added. He said: "Following the information from BRM, we discovered that funds meant for buying drugs at the centres for HIV/AIDs victims were misappropriated. "It was also discovered that documents were added in the names of two companies that we don't have any dealings with. 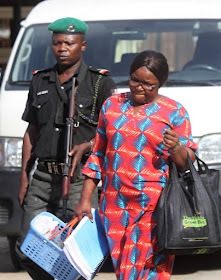 Under cross-examination by the defence counsel, J. O. Odubela, SAN, the witness confirmed that the money meant for the treatment of the AIDs victim was usually paid to Hope Worldwide quarterly. He, however, could not present the letter written to Hope Worldwide in court. Consequently, Justice Oshodi adjourned the case to June 26, 2018 for continuation of trial.